Richard Madden has revealed he wasn’t paid that much for his role as Robb Stark in Game of Thrones. Not that he feels hard done by, as he admits he had nothing on his CV that deserved big money as a 22-year-old. Despite that, he explained fans often thought he was rich anyway. Ten years on, the 32-year-old is now starring in the BBC One drama Bodyguard, where he’s appearing alongside Keeley Hawes. BBC One launched the series a couple of weeks ago. He added that he cares “less about how much other people are paid, and more what it takes for me to shut up and go and do my job”. Richard did however say he was worried by the gender pay gap in TV. “The equality thing needs to be addressed hugely between male and female co-stars,” he said. 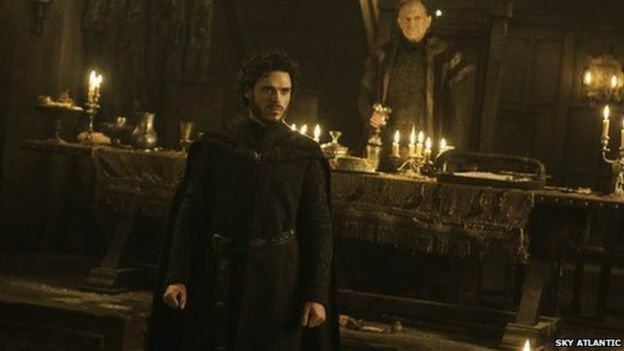 Soon out of acting college, the actor was cast was Robb Stark in Game of Thrones, where he apparently knew he would die within three series. Before that, he’d already enjoyed the start of a TV career as a teenager, which he says he’s grateful for. “Going into the world of Game of Thrones, I’d already learnt so much from doing it as a kid, of feeling isolated, or getting arrogant because you’re on a TV show.